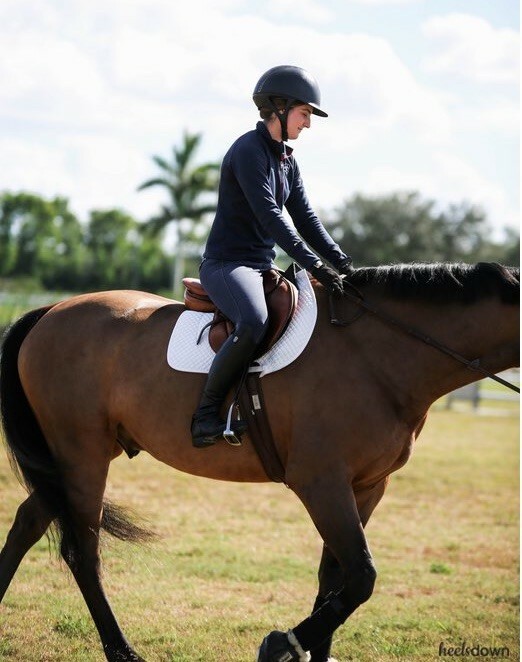 Grand prix show jumper Kelli Cruciotti offers insight on helping a horse that stops on course. Typically what we do first is make sure the horse is feeling 100 percent. That there’s no physical issues that could be contributing (to the stopping), especially if the horse has never stopped before. A lot of times horses stop because they’re uncomfortable. They don’t just wake up and decide to be bad. They can also be scared or nervous, and in that case we always drop them back down to what is easier for them, so if they are competing at 1.40m, we will drop to a 1.20m and so on. The horses get more nervous when you have to get after them, so it’s always about building their confidence and making them feel like they’re a superstar no matter what they’re doing. When you have a sound, confident horse, you pretty much can’t go wrong. Sometimes it’s not the division you want to be doing, but it’s what the horse needs. We’re huge on flatwork. I believe and my mother, Cindy Cruciotti (head trainer and owner of the Colorado-based hunter/jumper facility, Serenity Farm), believes that any problem over fences you can fix on the flat. More likely, if a horse has a drift you can fix that with dressage without making it an issue on jumps. If you build up the weak side, most of the time that will fix the majority of the problems. You have to be very stern but not too quick to punish. You can’t just pet them if they stop – it has to be a good balance of both. You can get a lot done without jumping a jump. If I had a horse that wanted to drift that led to runouts, I would make sure you can do leg yields, serpentines, and half-passes. You can also put down poles to simulate jumps without pounding their legs. Our horses tend to have pretty tough schedules, so you have to be creative and find ways to work on things without a lot of concussion and impact. You have to be careful when you do have a problem to not make it just about the jump. Then it can become a much bigger situation than it needs to be. With a horse that does a “dirty stop”, dropping down is still really important. Most of the time, when a horse throws in an unexpected stop, it might be scared. Being confident in your own riding and having a coach who is confident is important. The jockey has to be very confident in their distance choices and needs to be prepared to handle a problem how they think is appropriate. I think there are always exercises to do and also a lot of what the horses do in the show ring they usually do at home, so you need to simulate situations that challenge them a bit. Sometimes horses start stopping because they are uncomfortable, but then they can also learn that it’s easier to do. You have to be very stern but not too quick to punish. You can’t just pet them if they stop – it has to be a good balance of both. Nine times out of 10, they do come around but you do have the occasional horse that just doesn’t want to play. A period of time off might be helpful in that instance. A lot of this, again, is putting the rider in a situation where they’re going to be confident. The anxiety of finding a distance can be detrimental to a horse’s confidence. Dropping the rider back down if their confidence is low is a standard approach. Riding is a partnership – if one isn’t comfortable the other one isn’t going to be either. Both parties being 100 percent confident is important. I would drop them back down until they are begging to move back up. We are usually on the cautious side of moving up, but in the end they’re 100 percent ready to move up and can move up quickly because we don’t just move them up for fun. That goes for the horses as well and then you don’t get into issues like stopping because they’re really ready to do it. Riding is a partnership – if one isn’t comfortable the other one isn’t going to be either. So many people are quick to blame the horse, but you have to look at both sides. The rider is probably contributing to anxiety issues. I don’t believe horses just wake up and decide to be bad, so there’s always something you can try. It is important to be able to listen to your horse and know what feedback he is giving you so that you can appropriately address issues such as runouts or stops.